Have you ever wondered what it would be like to work in education? Would you like to pursue a different career and inspire students in the Construction industry, whilst working in a vibrant learning environment. We have many career opportunities available such as Trainer Assessor, Trainee Teacher, Learning Coach, Lecturer and Associate Lecturer and we are particularly interested in carpenters and electricians. To find out more, come to our recruitment open evening. 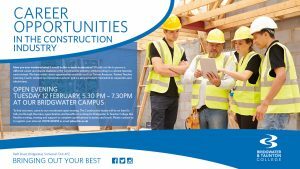 The Construction teams will be on hand to talk you through the many opportunities and benefits of working for Bridgwater & Taunton College like flexible working, training and support to complete qualifications to assess and teach. The Recruitment Open Evening will be held at the Bridgwater campus on Bath Road, Bridgwater, Somerset - please see the map below.